I need a log of outgoing emails that throw an error reported by Norton Security. Now, a Norton window will be opened (reporting the 'From', 'to', email subject and error description) about any uncorrectly sent email. After sending some hundreds emails to subscriptors, I receive various windows opened from witch I must copy the 'To' (recipent) email for resending. I don't find any log about those error messages, then, I must manually copy information from every windows to manage them. Where can I find that kind of log? Or, will be implemented in the future? Norton is not the cause of the blocked/unsent emails. I is just displaying information passed on by your email client. As such, there is nothing for Norton to log. What error descriptions are you getting for these emails? Who is your email provider? ie Gmail, Live, or your ISP? Provider: I use aruba.it: The smtp is about my site or the site names of the people who got the software (free downloadable). 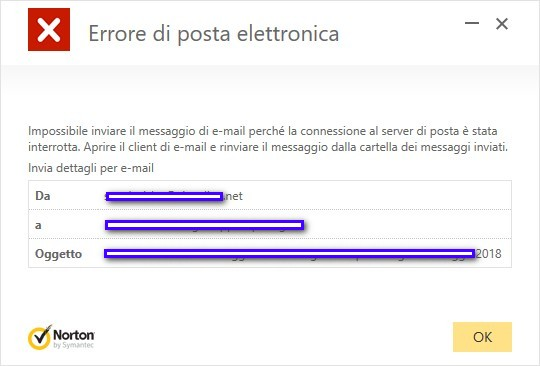 I am sure the error come from my smtp provider, but Norton intercept the messages and display them in more windows. Then, the client see the email correctly sent and cannot notify the user. If I can get those error infos from a log (instead a number of norton windows) it will a solution because I can manage a file. A very bad worst solution (and not fully tested) can be remove the Norton scan on outgoing messages. But I lose the check on the attachments and other benefits. Open Norton History (right click system tray icon, choose "View Recent History'). Select to show "Email Errors" from the dropdown list. I'm not sure this will be what you need, but it is the only logging that Norton would have. Hello guccio Have a look in Windows Event Log (usually in the Application log). To create custom logging for your application with dot net have a look at this MS article as well. Hi SoulAsylum, thnk for suggestion and link. It is not usable because the application use .Send() and receive the information "correct/good sent" and report it in a log. Some seconds later, Norton show that window I described and attached in first post. - the application send the message, wait for the answer back by smtp, receive it as good/sent, log it and go furher. - meanwhile Norton get the first email and scan it. That is because Norton settings (settings -> Antivirus -> Antivirus Settings -> Scan outgoing email - or more detailed in this page). and that configuration is proficient to ensure protection to recipients. - The Norton windows appear, but the app is gone various message ahead. You give me a new hint on Norton. You are right, infact I found the errors reported by Norton. Thank you very much; this is a good step. Your post it is a solution, because I can see informations I need.